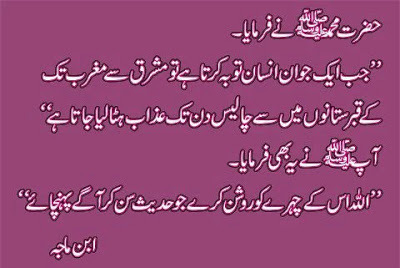 Tauba Ki Fazilat , virtues of repentance of a young Muslim in the light of Ahadith of the Rasulullah sallallahu alaihe wasallam in Urdu and English languages. As it is seen, it is stated above that the good characteristics that are listed above will be much better for the people who need them the most. Since a manager pass judgment on others so much, he will need justice more than anyone else. Generosity is better for the rich, because they have the opportunity to do the requirement of this characteristic. Everyone should be sensitive in religion but scholars who guide people and set an example for them should be more sensitive. Everyone needs patience. But a person who suffers from poverty should be more patient in order not to commit sins. Everyone needs repentance but it is good for the youth who are more inclined to commit sins. The feeling of shame (shyness) is good but when it exists in women, they will not show their beauty to others and they will avoid sins. Now, let us concentrate on repentance by the youth. The following hadith of the Apostle of Allah (PBUH), whose words have a light and hope, contains an important warning and good news for the youth. Since the repentance is “penitence”, it should be performed by its doer personally. A person cannot repent for any other person. However, he/she can ask forgiveness for others because, forgiveness means asking to be forgiven by Allah and we can want this for others. In order to be forgiven, one should repent at first. Such a person must be regretful so that he/she can beg Allah in order to be forgiven. As Allah said, “My mercy prevails over my wrath, (Muslim, Tawba: 4), we should also repent and seek forgiveness from Him in order to summon His mercy. Though the prophet Muhammad (PBUH) is sinless, he said, “I repent and seek forgiveness 70 times a day” because of the beauty of repentance and forgiveness. So, it is necessary to repent after committing a sin along with a good deed. Thus, that sin is destroyed. Why is repentance, which is so good, better in the youth? As it is seen, the real repentance is the repentance which is made during the summer of one’s life before indulging into the sea of sin. For, senses and talents are cleaner and nicer during the youth. Those who repent during the youth will spend their life with good deeds. Doubtlessly, regardless of age, repenting is certainly good and should be performed. The verses and hadiths given above explain us how the following words are meaningless and silly; “You are still young. Eat, drink, and enjoy your life. Give up praying, you will pray when you get older”. The following hadith should enable us to repent “Allah loves the youth who repent” (Jamiussaghir: 1866). There cannot be a greater bounty than Allah’s loving us. Nevertheless if we have committed too many sins or if we realize the truth when we get old, we should not be hopeless. The mercy of Allah is great. We should repent and seek forgiveness as much as possible and help the poor. May Allah make our youth among His slaves who repent when they are young.